Kim can't wait for her cousin Mia and her Siamese cat, Bibi, to come visit. But when they turn up, neither cousin nor cat are half as nice as Kim remembers! Mia and her cat proceed to make Kim's week a terrible one. . . but when Kim discovers a tiny silver kitten in her gardening shed, things seem to get magically better. About Angela Swan (Illustrator) : Angela Swan is a published illustrator of children's books. 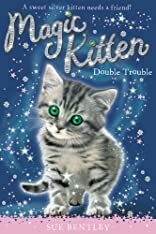 Published credits of Angela Swan include Double Trouble #4 (Magic Kitten) and A New Beginning #1 (Magic Puppy).